The soil is still cold, especially at night, so don’t get carried away. Peas and broad beans (and sweet peas) are a safe bet because they tolerate slight frost and are able to benefit from any warm afternoons and milder spells. Parsnips like the moist conditions of March to enable completion of their slow germination – it can take up to a month from sowing to emergence. Therefore do not sow them in soil where weeds have recently seeded, because weeds also like germinating in March and tend to grow faster than parsnips. This is why it pays to keep on top of weeds all year round, even in the cold half of the year when chickweed, meadow grasses, groundsel, bittercress and many others can be happily flowering and dropping seeds. Preventing this means clean soil and easy sowings. Carrots can be sown in March but only in warmer areas and on lighter soils: I find that the second week of April is often more successful, of a variety such as Early Nantes. 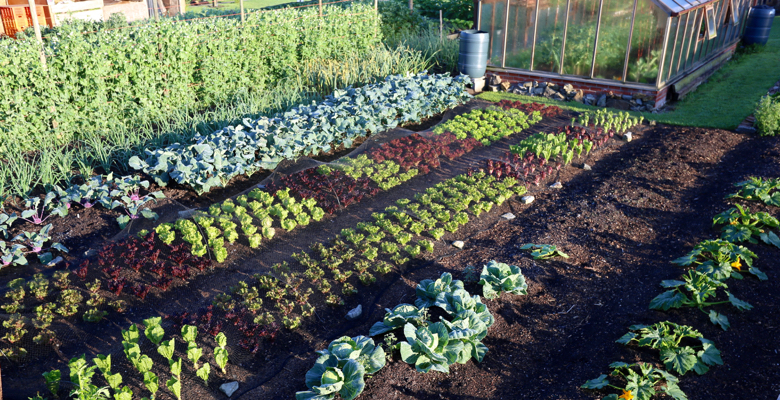 Lettuce, spinach, chard, early cabbages, calabrese and cauliflowers, beetroot, parsley, coriander, sorrel, onions and spring onions can all be sown now but it is generally easier to raise them indoors, to avoid losing tender seedlings to slugs. 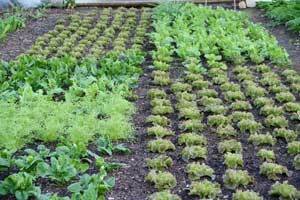 Whole sowings can disappear in one night, at this early time of year when tender seedlings are struggling a little in cool, damp soil. You will need to tailor the advice here to whatever facilities you have. Any protection from wind and rain will speed up growth, more in spring than at other times of year because the sun’s rays are becoming so strong, and can be wonderfully enhanced by glass or plastic, turning them into significant warmth. A greenhouse with some gentle heating, especially for cold nights, is the best option, but even a windowsill can be really effective at helping seeds to germinate and start growing, through a time of life when they are most vulnerable to slugs and adverse conditions. The photo above shows my tunnel’s salad on February 27th, all plants having been picked weekly since mid November. Harvests have been consistent and small, but of remarkable quality and quantity for the depth of winter. Now however, leaf size and quality off the same plants is improving markedly every week and it is a joy to work in there. All of the vegetables mentioned above can be sown indoors in March, although parsnips and carrots need deeper pots such as old toilet rolls. It can be great fun messing around with indoor sowings, using whatever containers come to hand such as egg boxes, lengths of guttering, and pots and trays you may have lying around. Do not worry to wash any old plant pots or containers before re-filling with compost. Although many gardeners and writers advocate washing and sterilising, I never have and many of my seed and module trays are over twenty years old, growing plants as healthily as ever. Heat loving summer vegetables such as tomatoes, aubergines and peppers need sowing by mid March (or on 19th – see below), preferably with some extra warmth, so as to have enough time to fruit before the end of summer. For growing indoors they want to be flowering by May, or by early June if you are growing them outside in a sheltered spot. On the other hand, wait until April before sowing courgettes, melons, cucumbers and squashes whose larger seeds propel them into rapid growth. They also need to grow quickly, in consistent warmth, in order to stay healthy, so it is better to start later and give them a clear run into summer. Finally, a top sowing day moon-wise is 19th March, two days before the spring full moon which this year falls on both Good Friday and the equinox. This makes Easter, on the first Sunday after the first full moon after equinox, as early as it ever could be, an indication of some promising early growth in the garden. January 2017 soil care, compost quality, no sowing yet!